Kati Katchever manages and operates the department's in-house motion picture lab processing 16mm b&w reversal film for students, staff, and beyond while continuing to provide general film tech support. Kati recently stepped up to take on the role of co-director in the department's Cinema Arts Archive, along with Carl Bogner, under the guidance of the venerable Diane Kitchen, professor emeritus. Kati is a 16mm and Super8 experimental filmmaker with early work focusing on the natural world, exploring the places where nature and spirit intersect. 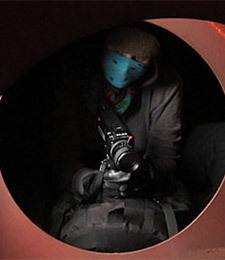 Currently, she is working in Super 8 film to create an ongoing collection of short, in-camera edited portraits focused on local and regional folk, places, and happenings (bio photo from 2011 filming of "freight hop"). She recently designed and curated the "motion picture postcards" series with "Dear Milwaukee" slated to premiere in Fall 2013. Also a singer/songwriter Kati can occasionally be found performing in local music clubs, solo or otherwise, recently accompanying the blues band, High Yellers.